Yes, we can try it on PC, but you must download or transfer the apk and obb file to PC. So, we may think we can try it on my phone, but you know how difficult it is to copy file and move file on phone, we have to download another file manager. Then we have to search the file manager again....wooo..... tooooo many steps. Dream League Soccer Classic 1Click OBB Installer includes Dream League Soccer Classic's apk file (49M) and OBB file (79M). Just click the apk file you downloaded, Dream League Soccer Classic apk and OBB will be installed automatically. I tried, and it works. 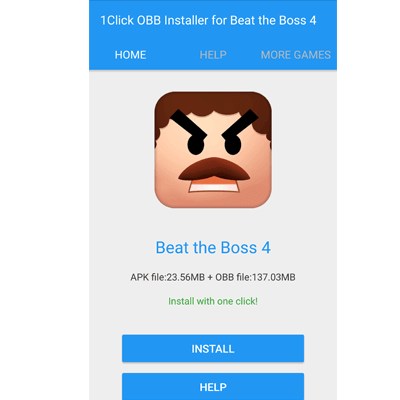 With 1Click Obb Installer, you only need one click to install APK and Obb files. 1Click Obb Installer will automatically transfer the Obb files to right place in your smart phones. You just need install the apk file. Then you can enjoy the game. You should download the 1Click Obb Installer at first (deferent app with different 1Click Obb Installer and the size is large). Then install the 1Click Obb Installer you download. Open the installer, click install button, waiting the Progress complete. Then installer will pop up the apk installation page, install the apk and you can enjoy the game.